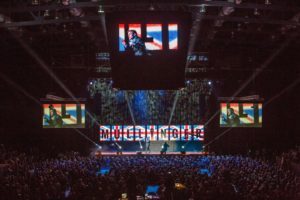 Over the last three years, there has arguably been no bigger cheerleader for the City of Saint John than comedian James Mullinger. 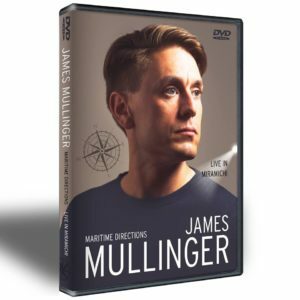 While Mullinger gears up to perform at Harbour Station on April 28, his second performance at the venue following his sold-out show there two years ago, he has released a new DVD – Maritime Directions – to tide fans over until then. Maritime Directions was recorded in Miramichi, which, in the bigger picture was an amazing decision as I’ve always felt places in NB that aren’t Moncton, Fredericton, or Saint John more than likely suffer from an inferiority complex when stacked up against the “big” cities. Did this play into your decision to record the DVD there? The main reason I chose Miramichi is because every show I have done there in the past has been an absolute joy. The audiences there are always so up for it and come out to have a great time so I felt confident that the show would be a good one to film. Also, the Vogue Theatre is such a beautiful theatre, steeped in history with all the original fixtures and fittings, so I knew it would look awesome on film. My last stand up special was shot at Harbour Station Arena in Saint John so I wanted this one to have a more intimate feel. I love doing the big rooms but after doing a special in front of an audience of 5000 people, I wanted the next one to be more up close and personal and the Vogue seats about 400 people which is just perfect. What do you look back upon most fondly about this specific show? Essentially that my hopes were met. I hoped that the show would be one of the best nights of the tour and it was. I had a total blast doing it. 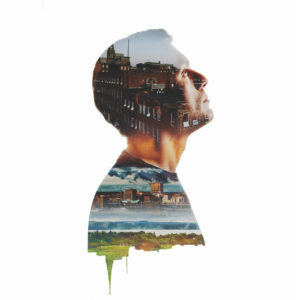 The show was produced by Mark Burnett and Didi Lombard Lloyd, a Saint John-based comedy production company and the DVD was filmed and edited by Tyler Warren Ellis, an incredible filmmaker from Saint John. The two opening acts were close friends Jimmy MacKinley and Cory Hartlen. So I was surrounded with people that I love and respect so not only did I know that I was in safe hands, I also had a lot of fun that night. It should have been stressful but it wasn’t. Minutes before I went on stage I was sat in the balcony dressing room sipping a Moose Light laughing at Jimmy and Cory’s sets. Yuk Yuk’s in Saint John is celebrating its first anniversary early in the new year. In your opinion, what have been some of the highlights – your shows or shows of others or any combo of the two – that have taken place there over the last 12 months? So many to mention! The one thing I can say is that after 13 years of doing stand up that Yuk Yuk’s Saint John is the best club I have played anywhere in the world. That is not an exaggeration. I have played clubs in Sydney, Australia, Los Angeles, New York, all over Canada and what Steven Barnes has done with his Saint John club is truly remarkable. And it’s not just me who thinks it. Very few comedians in history have played as many clubs as Mike MacDonald but he said it was the best after he headlined there last year. Why? Because Steve really really cares about stand up comedy. Some clubs are run by people because it’s a job. He does it because he loves comedy. I headlined the very first weekend there and am headlining the special first birthday show. It will be a special night. There were many people who said that Saint John could not sustain a full time comedy club. And it is true that it is the smallest city ever to have a Yuk Yuk’s. But conversely the Saint John club is beating the Toronto club some weekends both in terms of box office and alcohol sales. Later in the new year, you will be returning to headline Harbour Station. Given the success of your last show there, do you feel expectations are loftier this time around? Is that the kind of thing that makes you nervous or do you thrive on that energy? Excellent question. There is definitely more expectation this time. Last time I was just the chancer who moved here who wanted to see if he could fill the arena. I did and the show went well. Happy days. But now I need to take it to the next level. If I am going to do as my friend Monica Adair (of Acre Architects) told me and do this regularly, I need to make damn sure the show warrants it. So I have been working around the clock to ensure it is even funnier than the last one. Not a single joke will be the same as the last show in 2016. So if you were at that show or have watched the stand up special of it on Amazon Prime or Hulu you will be getting all new material at this show. I work hard at this job and I have one goal: to make the audience laugh harder than they ever have before. So every waking moment from now until 28th April I will be working hard to make that happen. Last time the big stress was would I fill the arena. But we have already sold more than half the tickets so at least this time I don’t need to worry about that and can just focus on perfecting the act. I also want to ensure that the whole experience is a joy for the audience. So from the second the doors open it will be back to back entertainment. As people take their seats they will be entertained by Ethan Ash, one of the UK’s top musicians (flying in just for this show). He has lots of experience playing these big rooms because he is Ed Sheeran’s favourite act and supported Ed on his big arena tour. The show will be MC’d by Australian comedian Garrett Clark who is probably my favourite comedian. Dr. Ansar Hassan will return to the stage with a new set and opera singer Kyla Lingley who is from Saint John but currently taking the UK by storm is also flying in to entertain the audience during the intermission. It is all about giving the audience the best possible experience, the best possible night out. I am a parent and I work all the time. So I know how hard it is to get out of the house. I also know that taxis and babysitters and drinks add up. So if people are going to be kind enough to go to all that trouble to come to my show, well, I am going to make damn sure they have the time of their lives. James Mullinger is on a cross Canada tour with his new show Let’s Do It Again from January to April. Tickets are available online at www.jamesmullinger.com. His new live DVD Maritime Directions is available now from Sunrise Records.